THE STORY - Settled in with the Brown family, Paddington the bear is a popular member of the community who spreads joy and marmalade wherever he goes. One fine day, he spots a pop-up book in an antique shop -- the perfect present for his beloved aunt's 100th birthday. When a thief steals the prized book, Paddington embarks on an epic quest to unmask the culprit before Aunt Lucy's big celebration. THE GOOD - One of the most stunningly beautiful and ingeniously designed films you will see all year, whilst also being hilarious, emotional and fun for all the family. While I greatly enjoyed the first "Paddington," I wasn’t as wildly enthusiastic as some. However, I heard that the sequel was even better than the first film and many British film fans included it in their top films of 2017. Now it has been released in the US and we can see if the sequel lives up to, or even surpasses the original. The film starts with Paddington happy and contended in his life with the Brown family and in his idyllic London street. His only concern is finding the perfect 100th birthday present for his Aunt Lucy in Peru. Of course, he seeks it in Mr. Gruber’s antique shop (featured in the first film) and there he finds the perfect thing. A beautiful, handmade pop-up book featuring landmarks of London. The only problem is the price – Paddington needs to earn the money to buy the book. Cue a series of hilarious mishaps while trying a series of odd jobs. Meanwhile, a beautiful old-fashioned steam fair has come to town and it is opened by local celebrity Phoenix Buchanon (Hugh Grant), a washed-up actor who is now relying on dog-food commercials. The pop-up book, which Paddington has been working so hard towards is stolen from the shop and Paddington is framed for the crime and sent to prison. The Brown family must follow a series of clues found at the locations in the book to help prove Paddington’s innocence. The production design, which was one of the strongest features of the first film, has taken a step up in the sequel. Even the prison is beautifully and intricately designed, with ingenious scene transitions and dream sequences. In prison, Paddington decides to help the chef Knuckles McGinty (Brendan Gleeson) provide the prisoners with more inspiring fare, which of course involves marmalade sandwiches. The Wes Anderson look of the film goes up a gear here, with pink prison uniforms, pastel-colored cakes and flower boxes decorating the balconies. Of course, the steam fair provides much of the visual feast, with a stunning organ ingeniously used in the final act. London locations are again shown off at their best – this time, Tower Bridge and St Paul’s Cathedral both used as part of the villain’s dastardly plot. "Paddington 2" will be one of the best looking films of 2018 and I just hope it is not ignored and forgotten by the end of the year. Costume design plays more of a part in this film due to Hugh Grant’s character. It is a tour-de-force performance from Grant, one I’m very happy has been recognized with a BAFTA nomination for Best Supporting Actor. The attic of his house (Yet another visually-appealing location) is a shrine to his past roles and roles he still desires to play. It is filled with mannequins bedecked in various costumes, which Buchanon talks to and inhabits as he plots out his unhinged machinations. He then adopts these costumes as disguises while hunting down clues, using the ‘treasure map’ that has been hidden within the book. It looks like the most fun Grant has ever had, deliciously skewering his own past acting roles (Real head-shots and stills from his real films fill his home). Make sure you stay seated during the credits to witness Grant take things to a level that no one could have anticipated. One criticism I had of the first film was that I didn’t love the CGI design of the bear. This has improved greatly for me in the sequel. He seems more solid and grounded, the facial features and eyes are also more realistic. However, I cannot say enough about Ben Whishaw’s performance. For me, it should be mentioned in the same breath as Andy Serkis’ work on the "Planet Of The Apes" series. The whole movie would come crashing down if the character of Paddington didn’t work and the reason it is successful is far, far more to do with Whishaw’s voice than the CGI. He makes Paddington into a fully-rounded, entirely believable character and of course, the quality of the actors around him helps massively helps in selling it too. Paddington’s interactions with the prisoners are so heartfelt, you can feel him winning them over. The sequel ends with a stunning set-piece, involving two trains in a chase that is a lot more ambitious than anything in the first film. Hawkins has a peril-filled water-based scene (For the second time this season) which left me genuinely tense. Bonneville is magnificent again, this time as Paddington’s fiercest protector and still conveying insecurities (Aging, trying to achieve promotion at work) that really shouldn’t belong in a family film, but I’m very glad that they are there. Bonneville demonstrates that he is a fine comic actor, especially when caught in an uncomfortable situation and also uses his physicality hilariously. Quite honestly, by the time the denouement came around, I was emotional and even shed a few tears, alone in the movie theater at 9 pm on a Thursday. 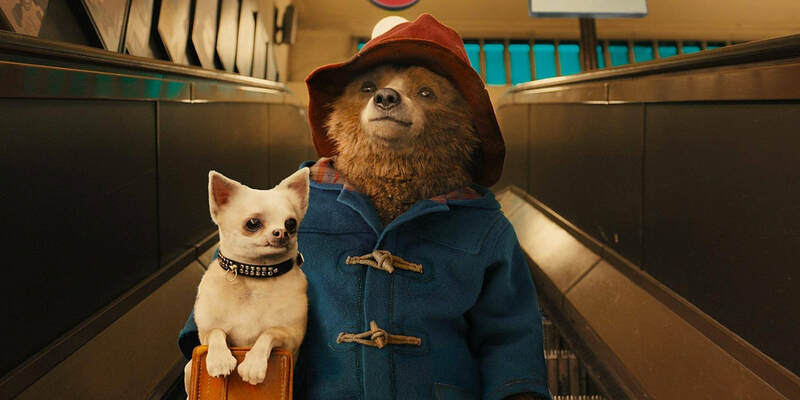 The "Paddington" films are as nostalgic, warm and cozy as "Downtown Abbey" and "The Great British Bake Off" – both of which have achieved success in the US. Once again, the sequel is portraying an idealized, fantasy version of London in which everyone knows their neighbors and helps each other out. I do believe they have made an effort to get a few more people of color in this time (A valid criticism of the first film), but only in minor supporting roles. I do encourage you to seek out this movie with the whole family though, you will rarely find a ‘children’s’ film that has had this much care and attention lavished on the visuals, as well as being funny and emotional and heart-warming. It’s just a lovely present to give to yourself, especially if you are feeling down. Treat yourself to something as sweet as marmalade and as warm as a bear-hug from Aunt Lucy. You won’t regret it.